Habitat loss and degradation is a major issue for Hellbenders. The species depends on cool, flowing, well-oxygenated water, and it needs a rocky substrate. In agricultural regions, most of the former rocky habitat has been buried under silt. Sediment from degradation of the river’s edge fills in the spaces between large rocks where Hellbenders live. This drives them out of their homes, making them more vulnerable to predation and capture. It also eliminates breeding and nesting sites, which can hinder reproduction and recruitment of young individuals. Habitat fragmentation is an individual on the small scale due to damming and other barriers but populations are not able to move between river systems. Dams ad other barriers on rivers have fragmented Hellbender habitat and segmented populations, making it difficult for them to find mates during breeding season. Hellbenders also appear to be intolerant of heavy recreational use of the habitat. Purdue University, the Indiana DNR, and The Nature Conservancy are working with individual land owners and farmers to educate them about the species and changes they can make to promote healthy habitat. 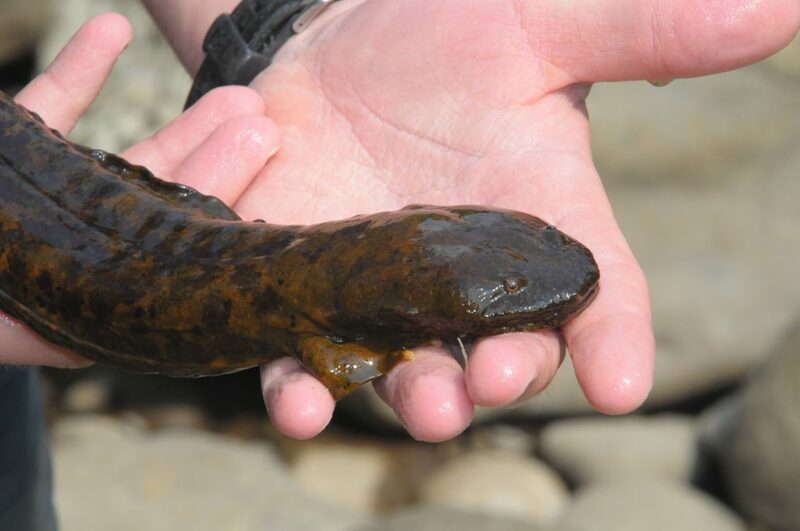 Purdue has partnered with 3 zoos (Mesker Park Zoo, Fort Wayne Children’s Zoo, and Columbian Park Zoo) to raise and display Hellbenders to educate communities about the species and grow Hellbender larvae for eventual release into the Indiana waterways. Learn more here. Researchers and managers are installing rocks and artificial nests for Hellbenders to use as shelters/breeding sites. See here and here for examples. Don’t move or blow up rocks in streams. Don’t take rocks or gravel from streams. Keep riparian vegetation if you live near streams. See here. Flooding is problematic in Hellbender streams, and in some areas, major floods may be increasing in frequency and intensity because of climate change. Hellbenders also require cold water, so as the environment gets warmer, this will become a larger problem. Fortunately, streams in the southern Appalachian highlands appear to be well buffered against climate change-related temperature stresses. Reduce your individual carbon footprint. Support policies and decision-makers taking action to reduce greenhouse gas emissions and help wildlife adapt to changes we’re already seeing. If your property is in riparian areas alongside a stream, keeping the streams shaded with trees can reduce water temperatures. Water quality is very important to this species. As water runoff that includes pesticides, fertilizers, discarded prescriptions, debris, and septic waste flows into the rivers where they live, the water becomes less inhabitable for the Hellbenders. Since they breathe through their skin, whatever goes into the water has potential to be absorbed by the animal. Some Hellbender streams have been affected heavily by mining pollution, which is believed to have affected Hellbenders. Sewage waste is also an issue in rural areas where septic systems may leach into streams. Road salts have also been shown to negatively impact water quality. Reduce or eliminate your use of pesticides and fertilizers. Use road salt alternatives. Maintain plants that can filter the water runoff before it reaches the waterways. Encourage municipalities to implement stream corridor protections and reduce runoff from urban and suburban sources. Over-collection for consumption, pet-trade, and scientific use has been an issue in the past, but it is unclear how much of a threat it currently is. It is illegal to collect them in almost all the states they reside, although there are anecdotal reports of Hellbenders being sold illegally in Japan. Fishermen have also historically killed Hellbenders that are caught on fishing lines, but this practice is declining. Purdue has a “Cut the Line” campaign which can be found in the Indiana fishing guideline pamphlets, as well as the materials Purdue prints for general dispersal. Rusty Crayfish, an introduced crayfish species, is invasive in some Hellbender streams, but it is native in others. Where it’s invasive, rusty crayfish are eliminating the Hellbender’s prey. Introduced game fish, like Brown Trout, Flathead Catfish, and Rainbow Trout, may also eliminate the Hellbender’s prey. These fish can also eat Hellbender eggs and larvae. Game fish are intentional stocked by many state and federal resource agencies. All of these species are spreading and are still being introduced. Don’t release animals into the wild or transport bait animals. Encourage wildlife resource agencies to manage for wild or native fisheries. Promote awareness of issues associated with illegal introductions in the angling community. Hellbenders are known to carry the Chytrid fungus and Rana virus, but it is still unclear whether these diseases are causing issues in wild populations. Both diseases have proven fatal, though. Chytrid fungus’ origin is not exactly known, but has been present in Africa, Japan, and eastern North America for a long time. The trade of amphibians for the pet trade and laboratory purposes has spread the disease to most continents. Several researchers are working to understand the impacts of common amphibian diseases on hellbenders, and to figure out why some are experiencing clinical issues. Wash and dry boats and other aquatic gear after each usage. Avoid moving water, animals or debris between habitats. Sanitize your footwear when you move between places. Do not import amphibians and check where an animal came from before purchasing it as a pet. Do not ever release a pet into the wild. Cool, fast-flowing, rocky, freshwater streams. Adults live under large rocks on the river bottom. Larvae can be found within gravel beds or cobble. The Hellbender salamander is one of the largest salamanders in the US. They are nocturnal, ambush predators that prey on fish, crayfish, insects, and other salamanders. They hunt using their sense of smell instead of eye sight. The breeding season is in late fall. Males choose a nest site where multiple females will lay their eggs . Clutch sizes average between 350 and 500 eggs. The males guard the eggs over winter and into spring. They will wave their tail frequently to rotate the eggs as they develop. Once the larvae hatch, they are on their own. They have external gills, which they later absorb and begin breathing through their skin. They are a long-lived and slow-growing species, taking 4-7 years for them to reach sexual maturity. Life span is unknown but there known records of individuals over 30 years old. Clean, well-oxygenated water is important because Hellbenders breathe through their skin. They are a great indicator species of the health of the environment because they are so sensitive to changes in water quality. Hellbenders have a lot of weird nicknames, including snot otter, devil dog, mud-devil, mud dog, grampus, and the Allegheny alligator.